The steam fountain on this 1922 Baldwin steam locomotive is a cast steel manifold that distributes steam to accessories and appliances such as the air compressor and injectors. 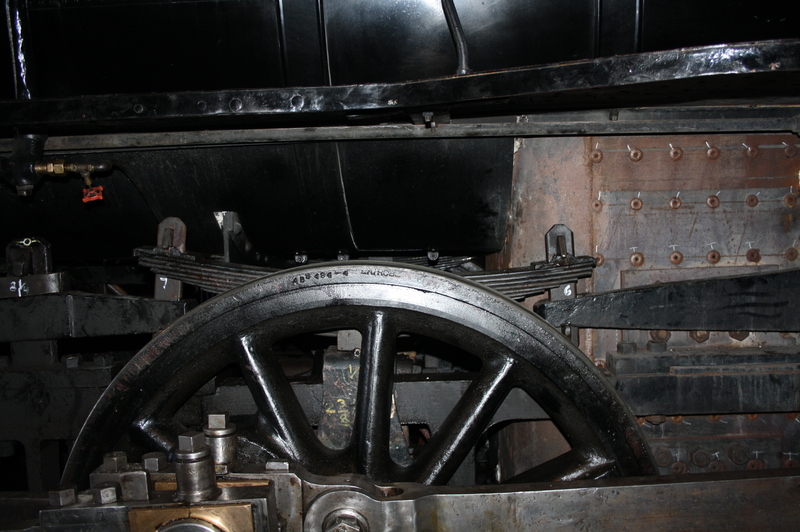 It is located on top of the locomotive boiler inside the cab. It is the main fixture for the distribution of steam to all of the appliances except the lubricator. (The lubricator has its own dedicated steam source.) The fountain gets its supply of steam through a pipe that runs all the way into the steam dome. The Turret Valve is the main “stop valve” that is used to shut off all of the steam flowing into the fountain in case of a steam leak or failure. 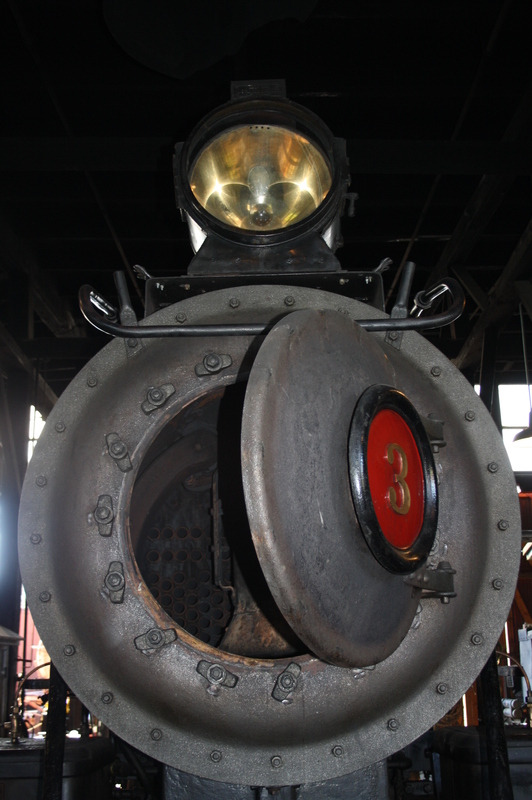 Early locomotives do not have this valve. All of the valves on the fountain are typically closed or open. The valves include – two injector valves for the Monitor lifting injectors, an air compressor valve, the dynamo valve, the steam heat valve and a valve that supplies steam to the fireman’s manifold. The air compressor valve was made by The Westinghouse Air Brake Company; the injector valves, firing manifold valve and lubricator supply valves are original valves made by the Baldwin Locomotive Works and have been on this locomotive since 1922. 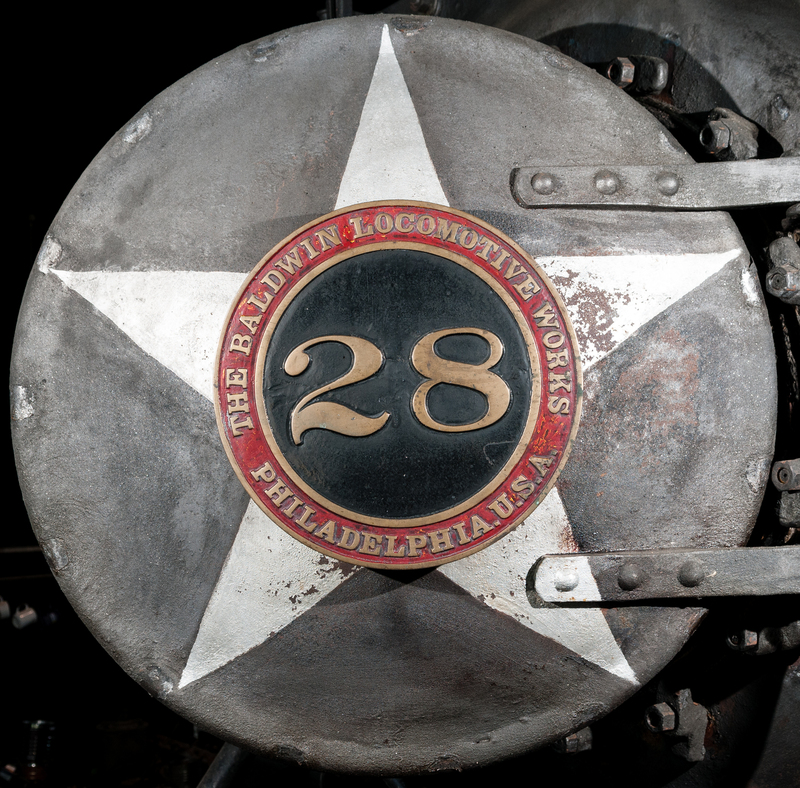 This 95-year-old locomotive is amazingly original. The image above shows the fountain when it was removed from No. 28 last year. The original firing manifold valve was removed in 1992 when it failed and was replaced with a contemporary Lunkenheimer steam valve. 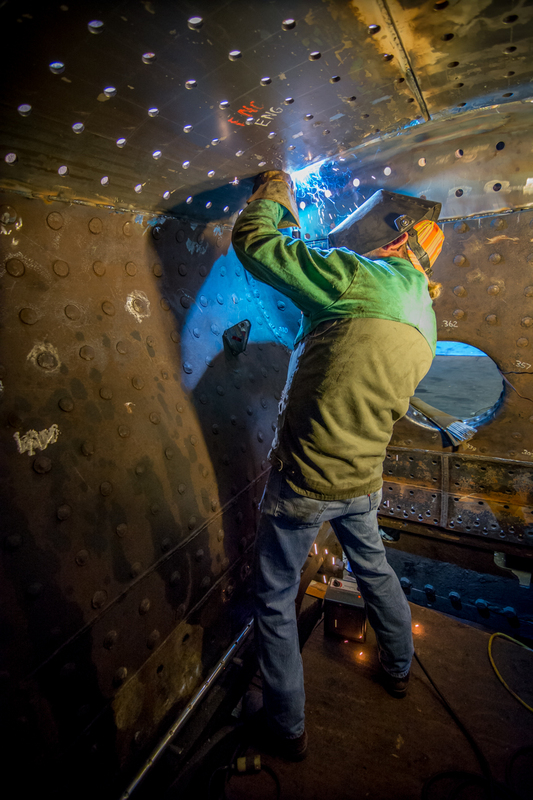 It is quite common with historic locomotives that are operating to make field modifications that keep the engine running but may not be historically accurate. Twenty five years ago, the worn valve was put away in the parts warehouse in the valve bin. This valve was located and was rehabilitated by volunteer machinist Robert Williams. It will be put back in its historically correct location getting the No. 28 that much closer to how it would have looked back in the 1920s. The type of valve that best describes the ones used on the fountain is the globe valve, seen below. The valve stem or spindle (E) is located in the center. It is the bronze rod with the red handle on it. The stem is held in place by the valve body (G) and the bonnet(C). The bonnet also holds the packing nut (F) in place over the stem. This packing nut along with the packing bushing hidden underneath the packing nut (F) (not shown in this image) keeps the steam from escaping up the stem. When the packing nut is tightened, pressure is applied evenly to the top of the packing bushing which then compresses the packing on the stem creating a steam tight seal. The union nut (B) holds the bonnet in place. The threads on the valve stem allow the sealing disc (D) to travel into the seat (A) or away from the seat (valve in the open position) when the handle is turned. This diagram shows the valve in the open position. A top nut (H) secures the handle to the stem/spindle. A succession of images showing the turret valve’s transformational refurbishment. 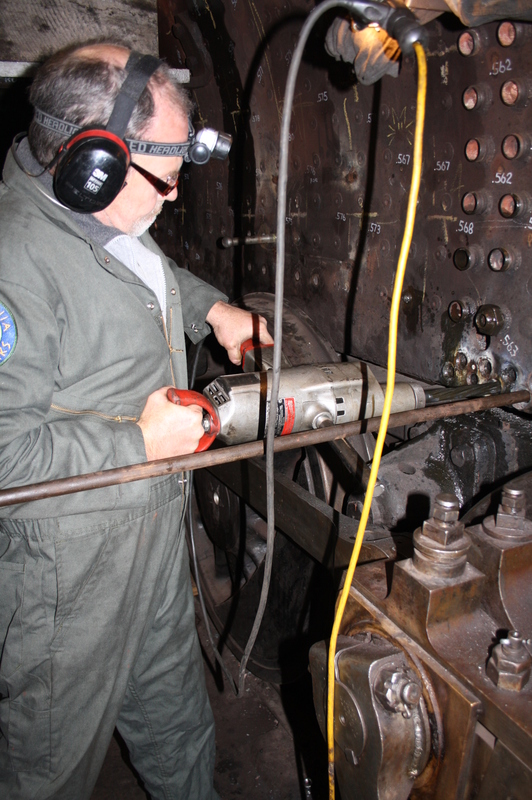 The work on the valves at the fountain is extremely specialized; as with most parts on a steam locomotive, there are no part numbers and no technical support. All of the fountain valves needed attention. 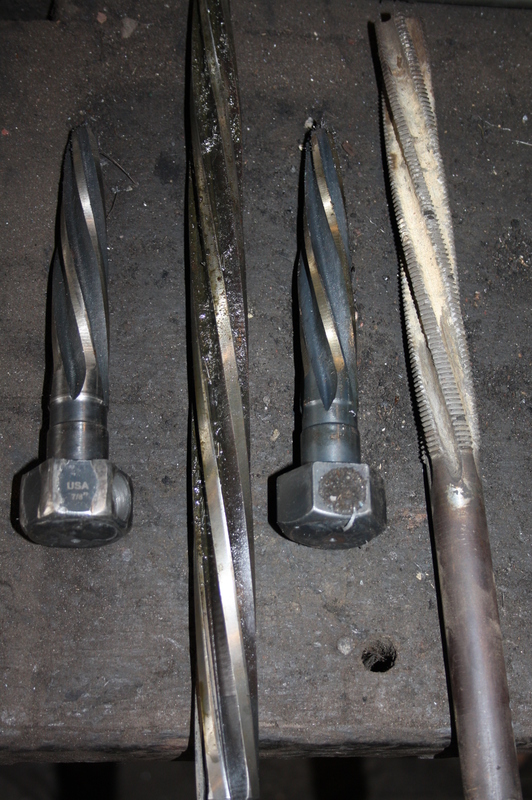 Most stems/spindles were completely worn out allowing a lot of play- some almost to the point of thread failure. 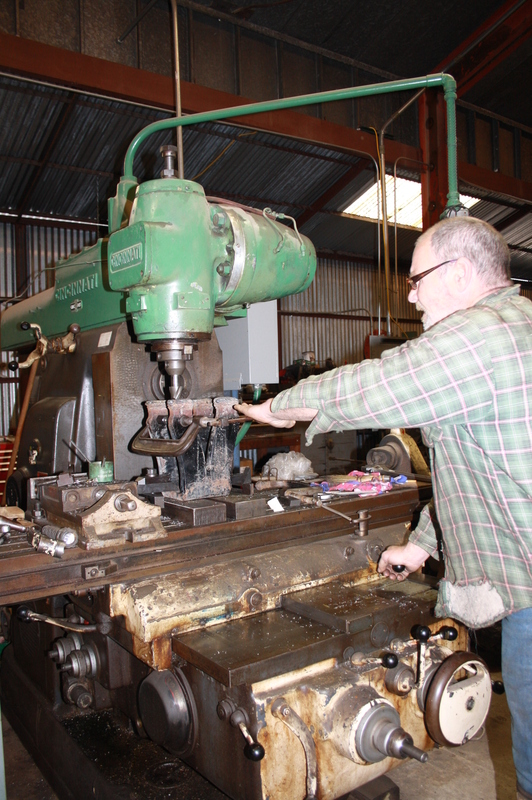 We ordered C464 bronze stock and volunteer Robert Williams fashioned completely new valve stems for these two valves. Since the stems were very worn, and the internal threads in the bonnet were somewhat less so, Robert used reverse engineering (and some guesswork) to sneak up on the exact dimension and make a perfect fit between the internal threads of the bonnets and the new spindles. All of the packing bushings in these globe valves were found to be in poor condition so all new packing bushings were made to fit the needs of each valve. At the request of George, Robert included a custom lip on the top of each new packing bushing which will make servicing the packing in the future much easier. The nuts that secure the handles to the top of the stem/spindle, was also of dubious quality with no common design between any of them. It was easier to start fresh with stainless steel hex stock and make tall heavy style hex nuts that will complement the entire set of rebuilt valves and look great for the next century. A custom “washer cut” was made on the nuts while in the lathe so the bottom of each nut will never need a flat washer in service. The turret valve had a much-corroded seat. 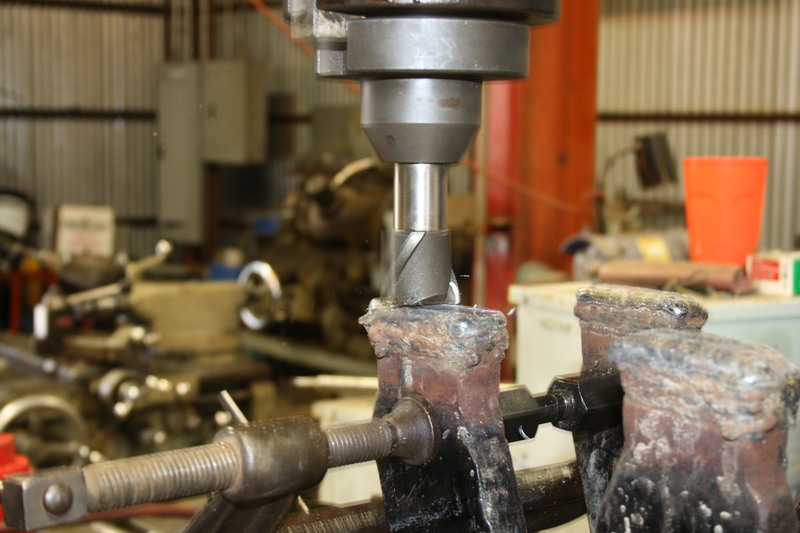 Our gracious volunteer machinist used a 3 ½ “valve seat cutter to recut the turret valve seat to perfection, removing almost a century of pit corrosion that looked like Swiss cheese. 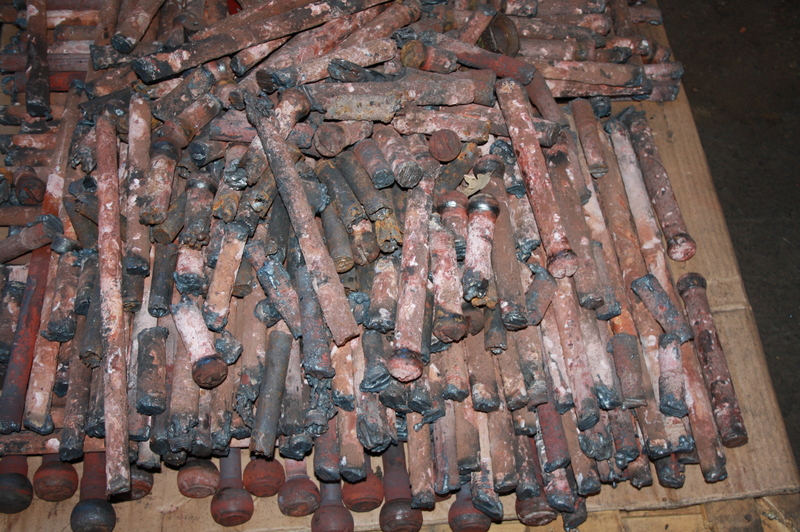 Nearly a century old, the valve stems removed from the various fountain valves were worn, some very worn. 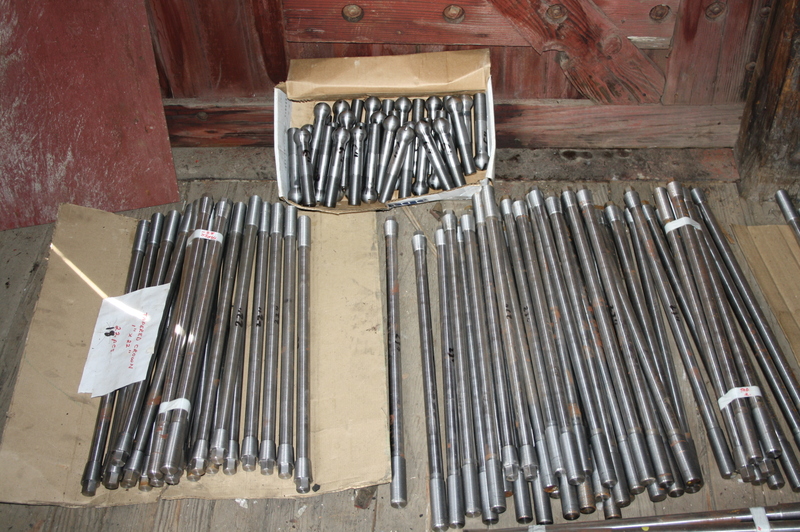 Here are the refurbished valves that will be installed on the fountain. After getting the boiler water tight and completing the hydrostatic testing, everything that was taken apart begins to come back together. 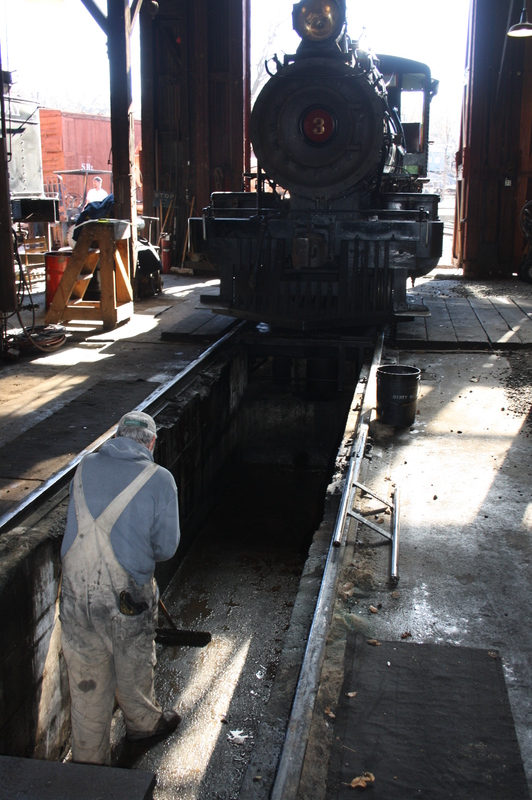 All of the items removed from the locomotive for access to the boiler were closely inspected for wear and tear and either determined to be refurbished, replaced with like materials, or found safe and suitable to go back on the engine. The list of parts is extensive, but here are the highlights from the last few months. New steel plate installed in the firepan. 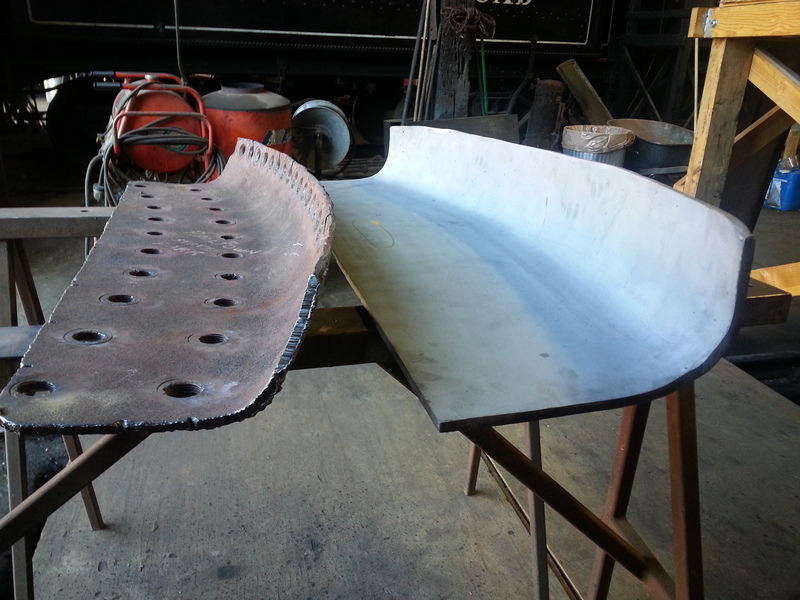 This image shows the old repairs (stabilizing the firepan with old rail) re-worked onto the new steel fabric under the pan. 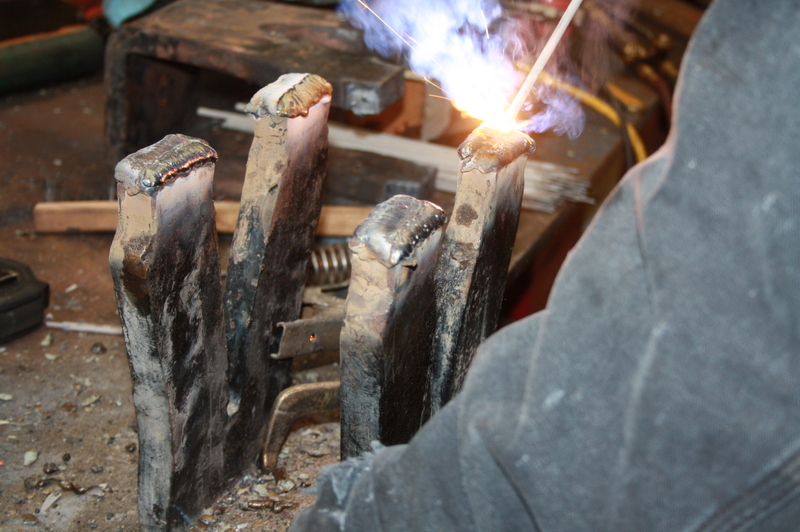 The firepan and damper box had to have extensive work done on them. The bottom of the firepan was replaced with steel plate. The old firepan had been reinforced with 40 lb. rail in two places. 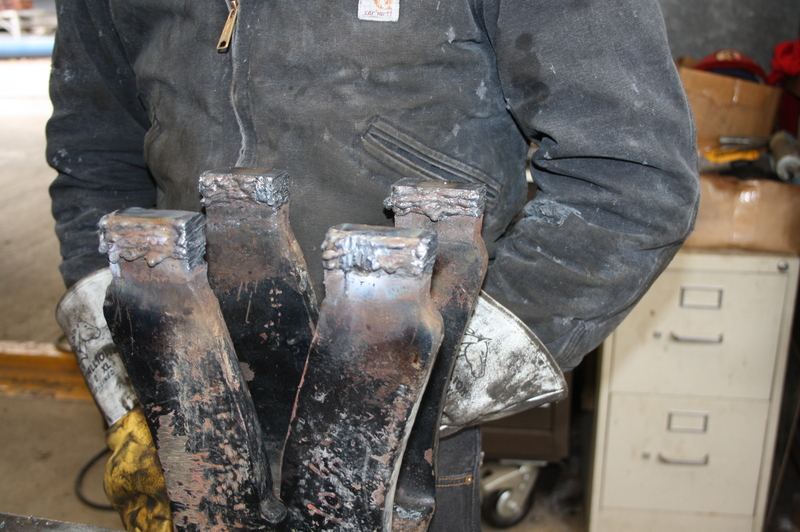 The ends of the old rail had been forged smaller to fit flush with the firepan and then riveted on. This kind of repair clearly demonstrates the thriftiness and ingenuity of a lean short line railroad. The lead restoration worker was unable to determine whether or not this firepan was the original one from 1922. 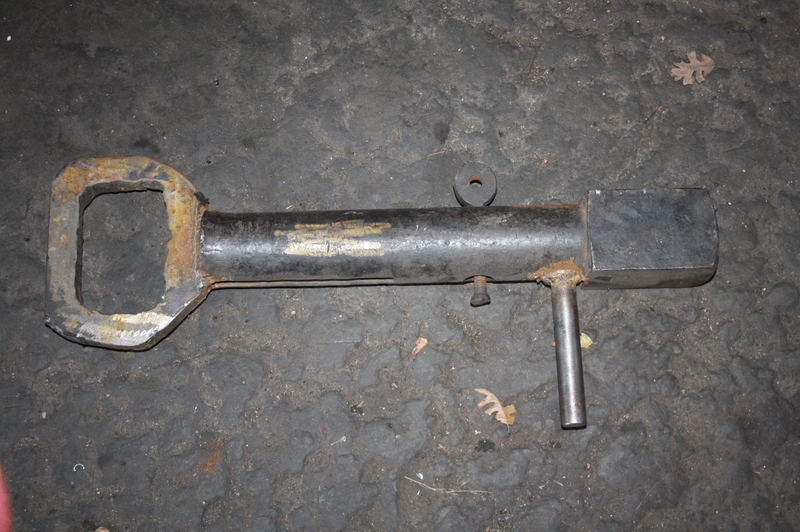 An entirely new damper box was constructed with exception of the riveted joints. The sides of the box were replaced with plate. The damper box is now made up of both old and new fabric. 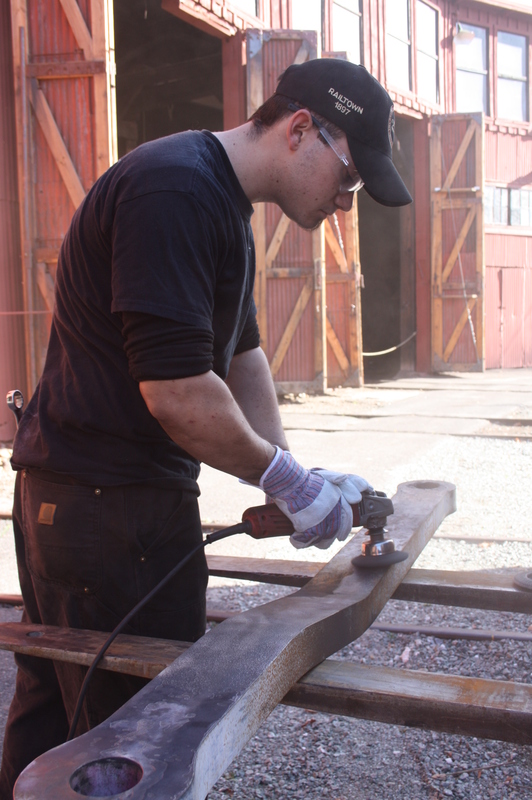 Scott Botfield applying new sides while saving the old riveted frame. Moving along to the front end, all the bits in the smoke box were reinstalled. 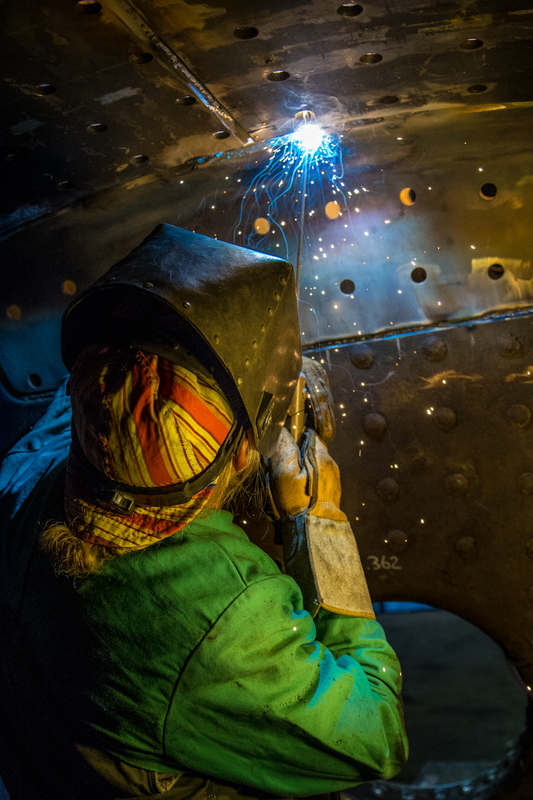 The superheater elements, that had been tested previously for leaks went in and were tightened with a careful touch to avoid breaking the header. The header is a complex iron casting in the front end that receives saturated steam from the throttle, distributes it to the superheater elements, collects the superheated steam and delivers it to the piston valves through the distribution pipes. When the original nozzle stand was tightened back into place, one of the mounting flanges broke off while being tightened down. 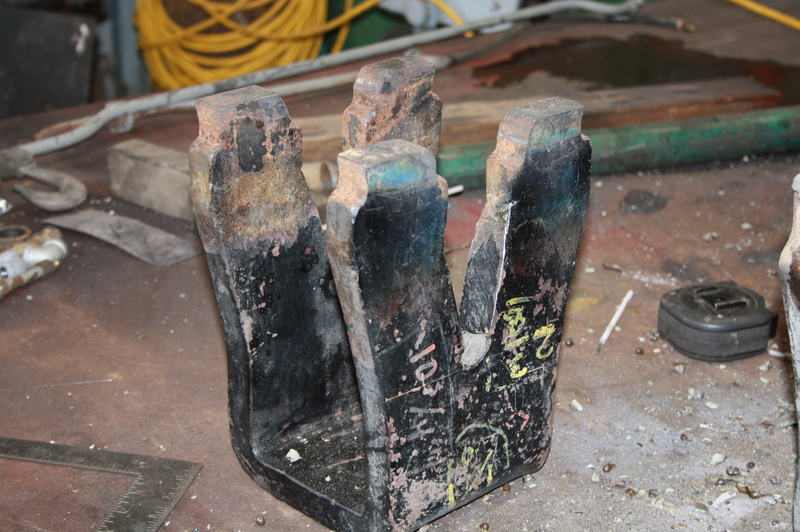 Inspection at the break revealed that the metal was extremely thinned from 94 years of being exposed to the corrosive environment of the smoke box. Miraculously, the new old stock replacement part was found outdoors alongside the warehouse. It was in pristine, unused, unapplied condition. The “new” nozzle was identical to the old one. Finding this part was a huge time saver, for had we not found it, we would have had to make a pattern and send off to the foundry for casting. Volunteer Robert Williams came in and machined the new holes for the studs and fly cut the base, as the “new” nozzle stand was a rough casting. On the left is the old nozzle stand. Note the thinness at the base compared to the “new” nozzle stand on the right. 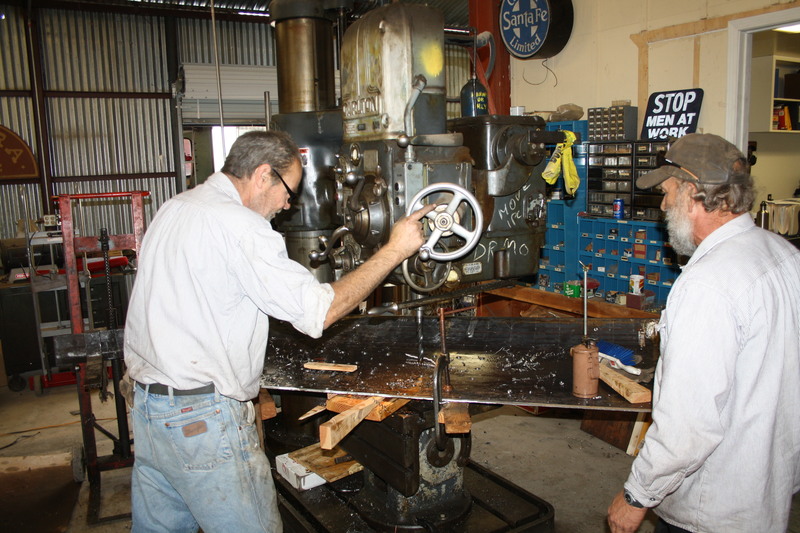 Here is the shop set up for machining the nozzle stand. After the nozzle stand was tightened down, the petticoat and smoke box netting were installed. The smoke box ring and door were freshened up and placed back on making the front end look like its old familiar self. The bell was polished by spinning on a lathe and reinstalled after new pins had been made. Here is the refreshed bell on its way to No.28. The sand dome went on. At the cab, the floor and cab braces were patched with new steel, replacing the old, bent and pitted plate that was there before. The lagging bricks are in the back and on the steam dome, the foreground shows the “mud”. The lubricator lines were reinstalled and then the lagging was applied. The lubricator lines go in at this time because they travel all along the boiler from the backhead. They are hidden under the jacket. The lagging (insulation that covers the boiler) is composed of calcium silicate blocks. Until the early 1980s it contained asbestos. All of the material used today is asbestos free. 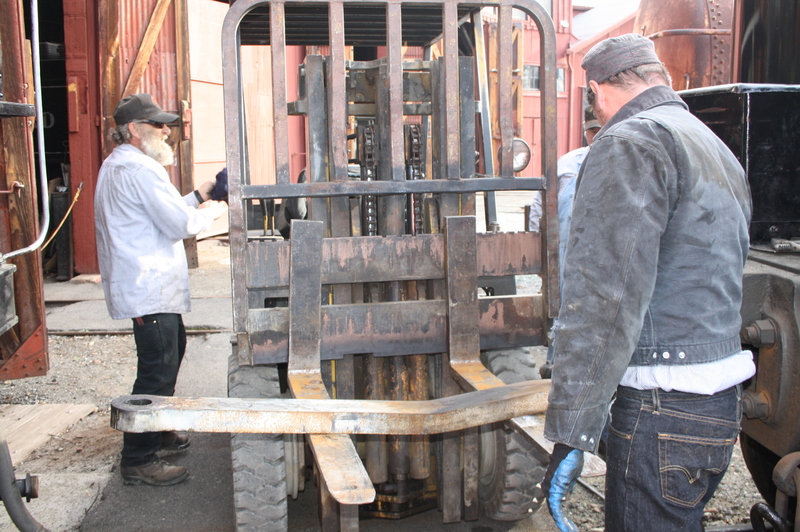 The blocks are held in place along the boiler barrel with wire, and then given a rough top coat of “mud”. The mud is calcium based cement that is plastered into the crevices between the lagging blocks. This insulation helps to retain the heat in the boiler. It also evens out the surface of the boiler so that the sheet metal jacket has continuous support beneath it which keeps it smooth and good looking. 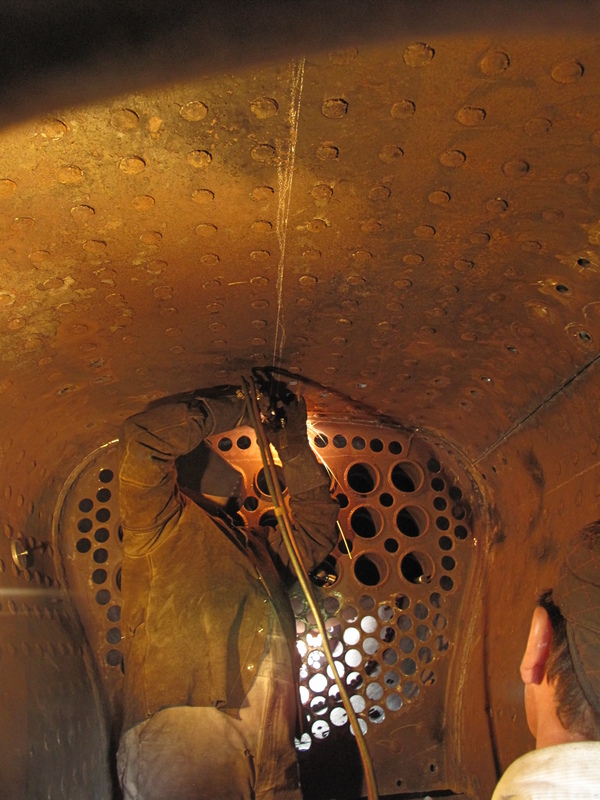 Now we are working inside the firebox adding new refractory brick after reinstalling the old burner. The burner is a Von Boden, made in San Francisco. New refractory brick commencing at the damper box, eventually it will cover the bottom and sides of the firebox, leaving a space for the Von Boden burner shown at the center. 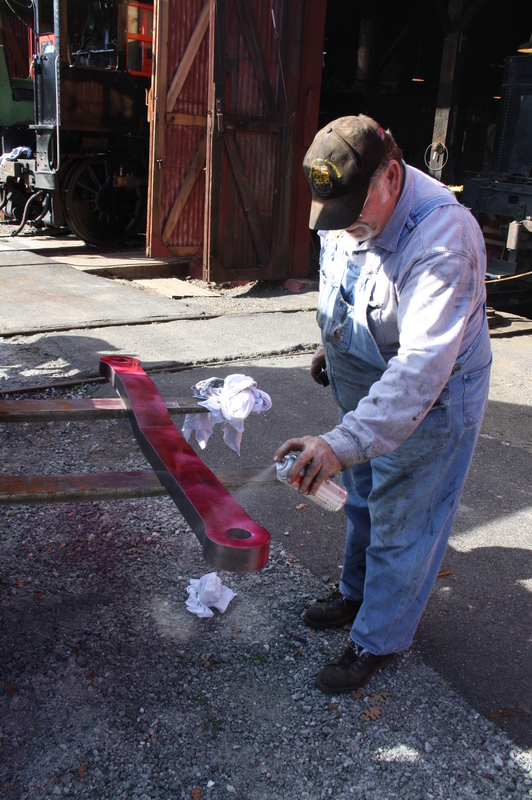 Meanwhile Eric is putting the finishing touches on the tender and also painting the plumbing lines and accessories. Prep for the tender was extensive. Assistant Eric Dowty filled pits and dings, and then primed. In the back ground, the final paint on the tender, and the foreground showing all the bits that will be painted soon. The steam fountain comes next. 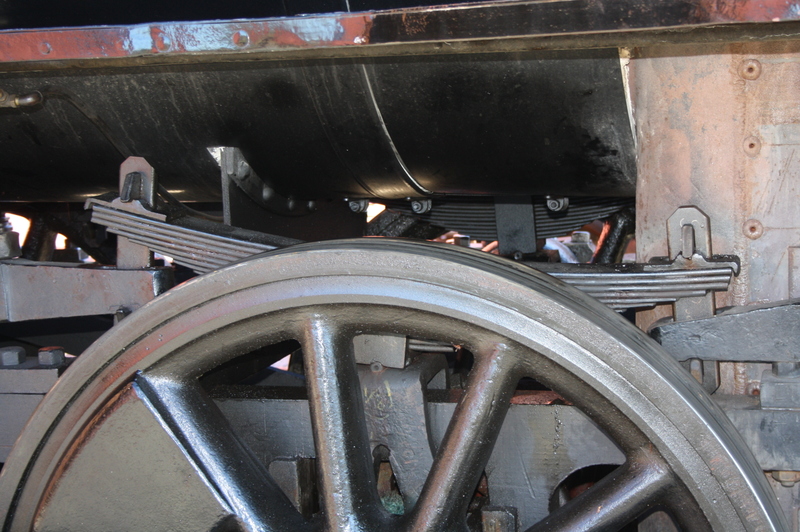 It is the main manifold located at the top of the boiler in the cab that distributes steam to all of the accessories. It comprised of the main steam shut off (turret valve) and other associated valves that control the flow of steam to all of the accessories such as the injectors, air compressor, fireman’s manifold, etc. Look for details on our next blog entry. Behind the scenes at any railroad is the mighty track car. A track car or speeder (also referred to as railway motor car, putt-putt, track-maintenance car, crew car, jigger, trolley, quad, trike, or inspection car, and also known as a draisine (although may be unpowered), is a motorized maintenance vehicle used on railroads around the world by work crews, track inspectors and emergency response crews to move quickly to and from work sites. The track car is slow in comparison to a train or automobile, it is called speeder because it is faster than a hand car or human-powered vehicle. Most cars have a top speed of about 35 MPH. Track cars are small in stature however these maintenance of way vehicles perform any number of tasks. 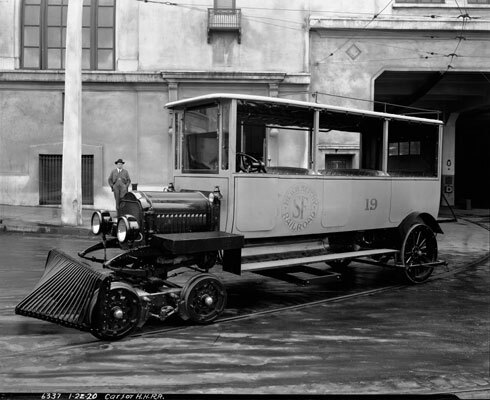 On modern railroads, this unique type of vehicle was replaced by ‘Hi-Rail’ (or HyRail) vehicles. Hi-Rails are modern trucks specially fitted with flanged wheels. The rail wheels can be raised and lowered as needed and they are legal for use on both the highway and rail. At Railtown 1897 State Historic Park, track cars are most often seen as “fire patrol”, ferrying a crew of dedicated volunteers that keep a lookout for fires started by errant sparks from our steam engines and to promptly extinguish the flames. Not all of the speeders in use today are historic to the site. We catalog here, a visual sampling of the speeders or motor cars at Railtown 1897 State Historic Park. 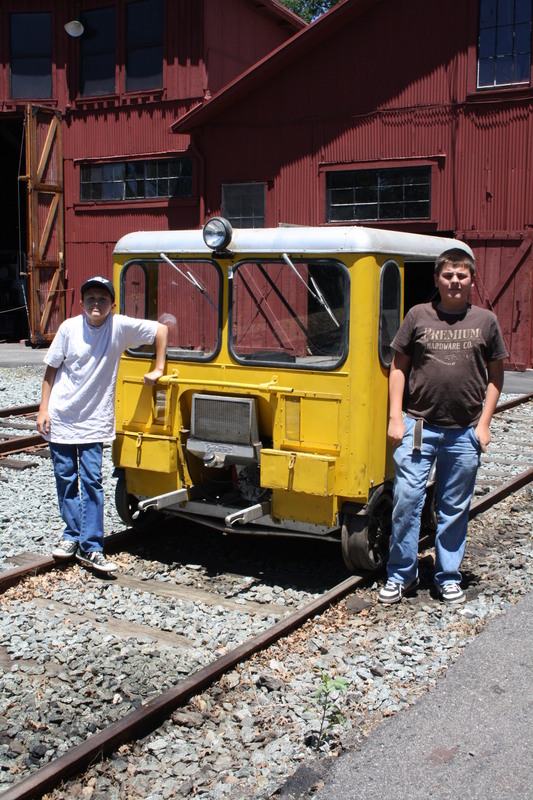 Some of the more restored speeders are the ones we use in daily operations while the older and more “crusty” looking ones are kept intact as collections pieces because of their documented relevance to the Sierra Railway during the earlier years of operations, before the diesel era. In the preservation world, they are highly valued for their original, unrestored condition in their original context. Under the Secretary of Interior’s Standards for Preservation, this is known as preservation integrity, and we work hard educate visitors to appreciate them in this state. Anyone can apply a fresh paint job, but it is rare to find original equipment, in original context, in un-restored condition. MW 80 is known among the engine crew as the “Great White”. A Fairmont A-8 motorcar, it came to Railtown from the Sacramento Southern Railroad at the California State Railroad Museum. We use this car often during the operating season, and since it holds 8 people it is usually our offering for special events that include speeder rides. Tucked away in the track auto house or “Speeder Shed” is speeder #102. It has been here since the early years. It is a Fairmont A5-A series car, this dates to the early 1930’s. These cars were called Large Extra Gang Cars and could carry up to 11 workers. No longer operable, its engine is a Continental Motor Company Red Seal, 4 cylinder engine. With parts missing, and a frozen engine, it may sit for quite some time as is. Sry #104 is one of the older Sierra motor cars. It is a Fairmont A5 series B-4 manufactured around 1937. The car operated with a 4 cylinder Waukesha engine, and has a capacity of 9 men. This car was once abandoned at Chinese Camp, and came to Railtown 1897 State Historic Park in the early 1990’s. SRy #106 in the machine shop of the roundhouse. SRy #106 is a sister car to the 104, it is of the same make and manufactured in 1937. It operates today, but is reserved for very special occasions. It has a canvas top. 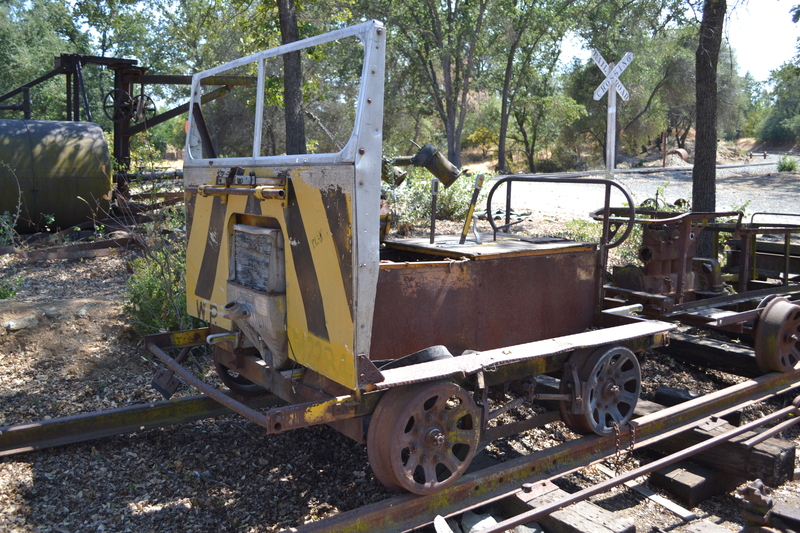 It was acquired from the Sierra Northern Railroad in Oakdale in the early 1990’s and brought back to Railtown. Both the 104 and 106 ran on a Waukesha 4 cylinder engine. Today, both are kept under cover. SRY #108 is a newer Sierra addition. It was painted SRR 108 back in 1978. This Fairmont A-5 was part of the original facility acquisition by California Department of Parks and Recreation in 1982. It was probably manufactured in the mid 1950’s. Though it is historic to the site, its age puts it right on the cusp of the advent of the diesel era and Railtown’s period of significance. Today it is fully operable and is carfully cared for by our dedicated volunteers. SRy #110 with park volunteers. 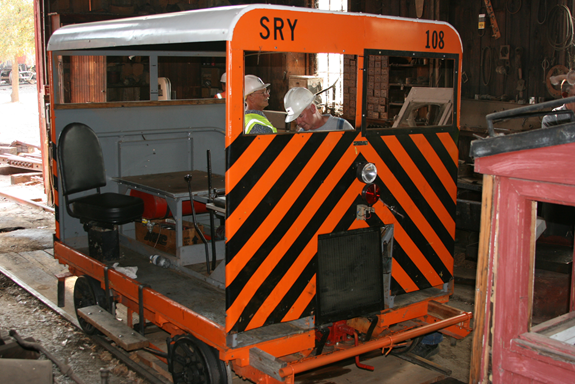 SRy #110 is a Fairmont M19-AA two man light inspection car. It also is a later Sierra acquisition from the Western Pacific. It was manufactured in 1955 and is operable. This model is configured with the aluminum cab and painted “federal yellow”. SRY #114 is also a newer addition to the Railtown roster. This motor car came from the Western Pacific originally. 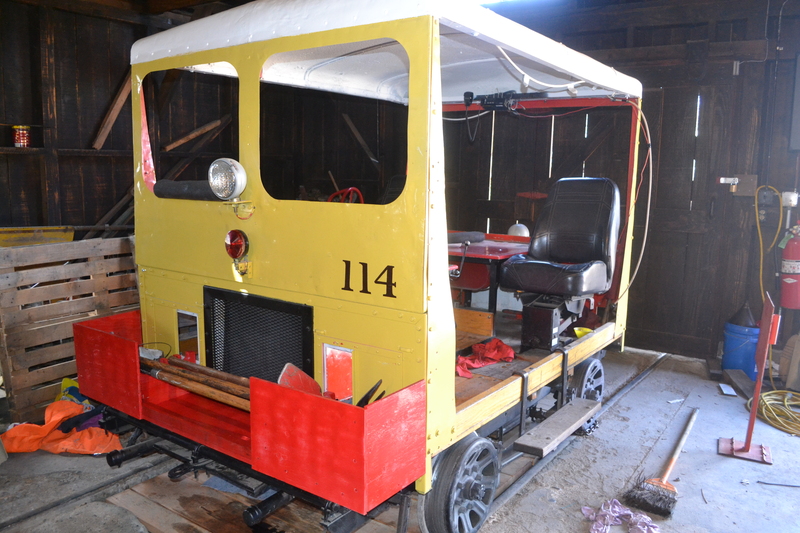 It has had extensive rehabilitation work done on it in the past few years, including a new engine, paint job, and most recently a new tool box. 114 is currently running as our primary “fire patrol” speeder. This type of motor car is a Fairmont A-5. 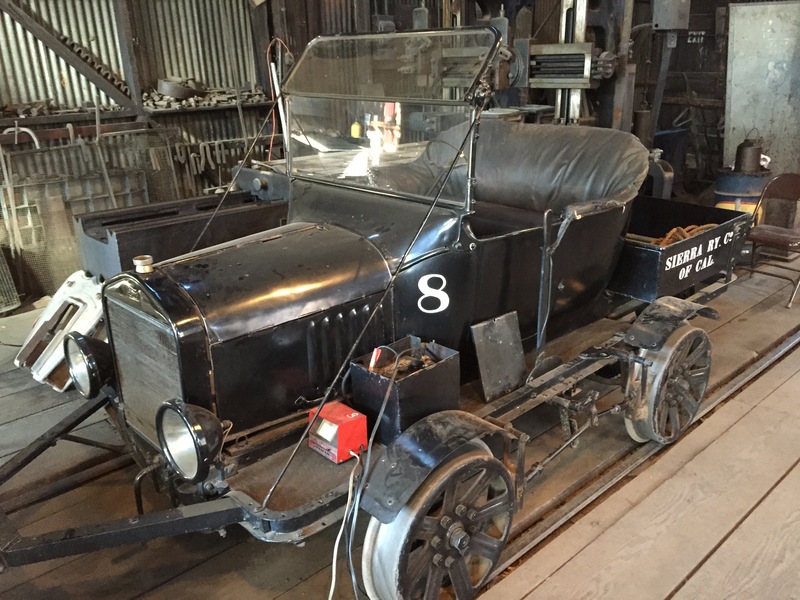 This is by far the oldest and most mysterious motor car at Railtown. It is a Sheffield No. 33 model. It has a 2 stroke, 3 cylinder engine with a direct drive. This means you pushed the car to start and away you go. No idle, it runs when on. Records show that there were six of these running along the Sierra lines in 1922. This one is probably a remnant from this original fleet. It is stenciled “S.R. Motor B.” in white with dark red body. Out on “speeder hill” at Railtown, you can find a number of speeder bodies and parts that are sometimes used for surplus. There are two relatively intact speeders on the grounds that were acquired by the Sierra from Western Pacific. Manufactured in about 1960, one of these cars (above) has a belt drive, and the other (below) has a transmission. We do not have record of Sierra numbering for these cars or if they ever ran on the Sierra line. 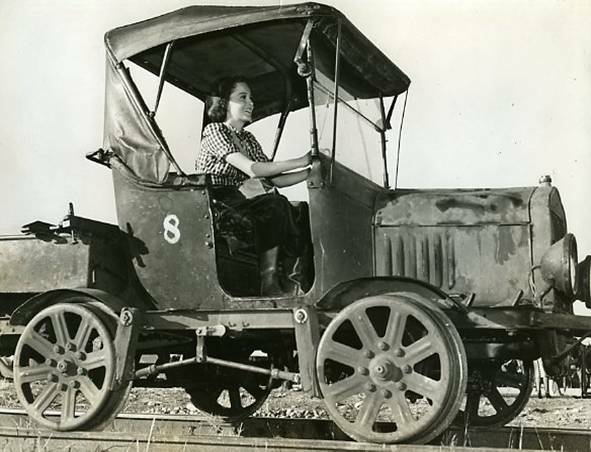 Actress Olivia de-Haviland driving the #8 during the filming of “Dodge City” 1939. 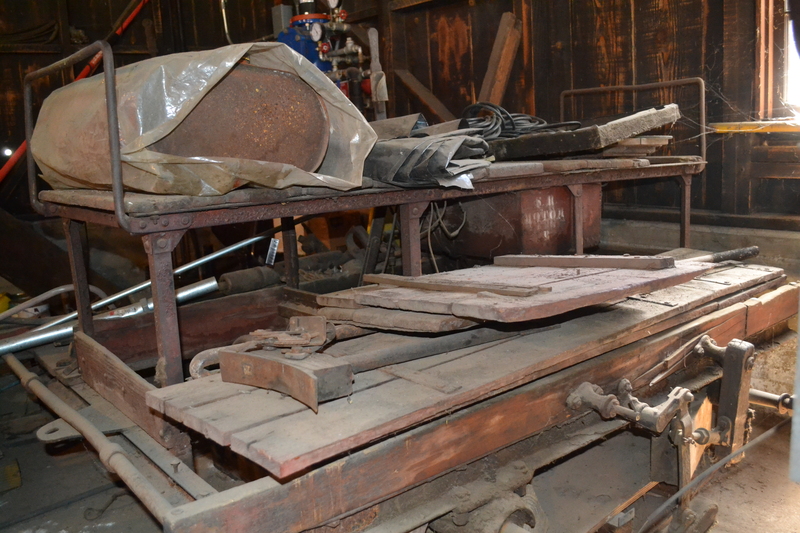 One of our crown jewels found in the historic belt driven machine shop is SRy #8. 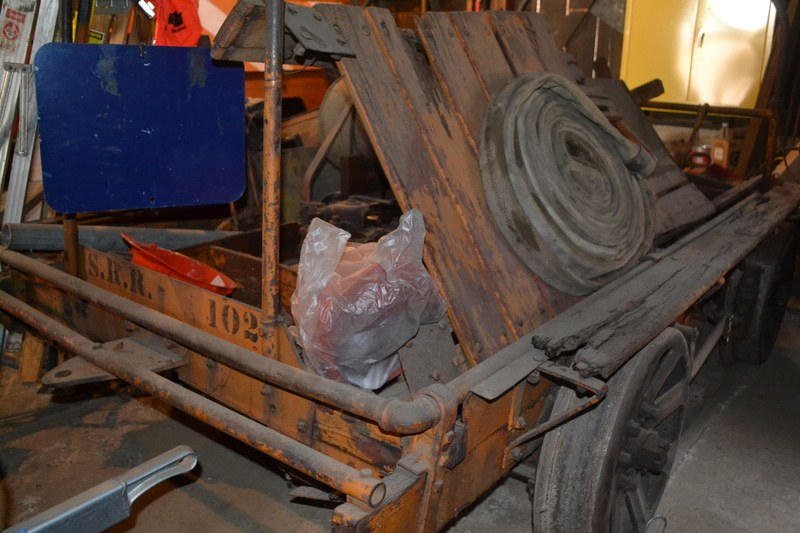 This Ford model T is mounted on a Fairbanks-Morse frame and dates from around 1922. 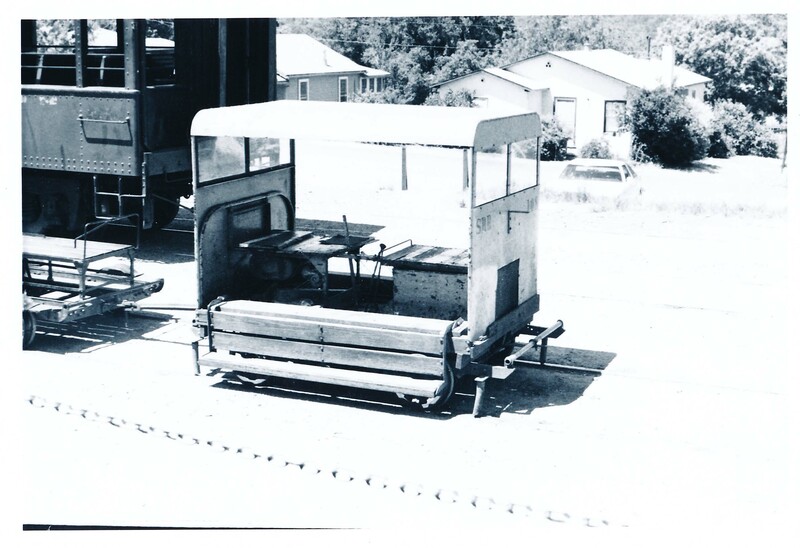 Though technically a track auto, this two-seat rolling stock was most likely used for light track inspection, or as a paymaster’s car. Today, the car still operates for special occasions, but does not go far from the Roundhouse. #19 “Hetch Hetchy”, circa 1920 at the San Francisco Muni shops where it was built. #19 “Hetch Hetchy” with park volunteers. The #19 “Hetch Hetchy” is an upscale track car. Its frame and motor were built in 1919 by the White Motor Company. The passenger body is by Thompson-Graf-Edler of San Francisco and interior appointments by Meister & Sons of Sacramento. 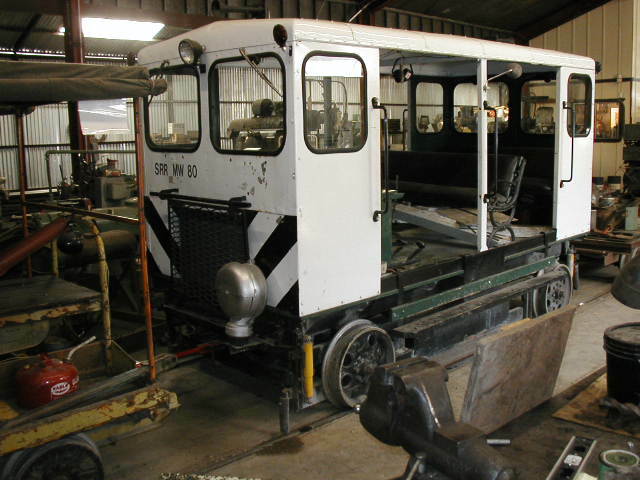 The front rail trucks, wheels, brakes and self-contained turntable were added by the San Francisco Municipal Railway shop. The first “track bus” No. 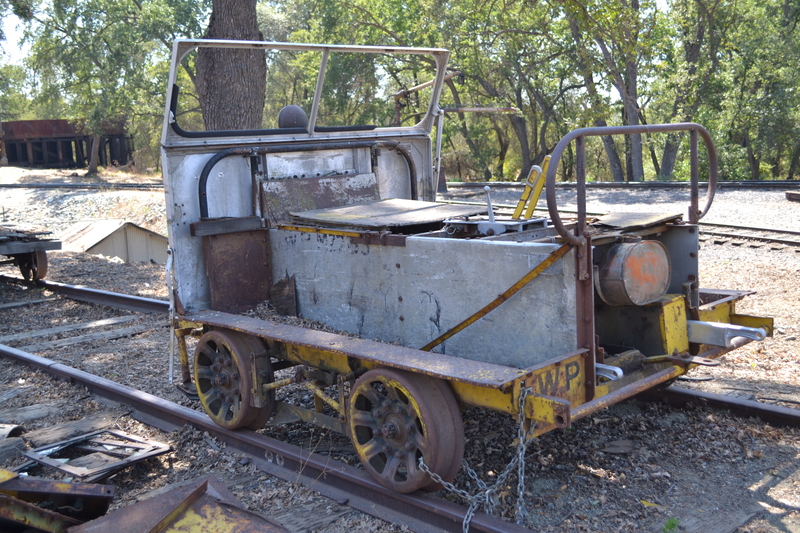 19 could carry thirteen passengers, but was originally furnished as an ambulance car during Mountain Division construction and was used on the Hetch Hetchy dam project. Faster than most “speeders”, it originally could travel up to 5o MPH on level track, running in overdrive. 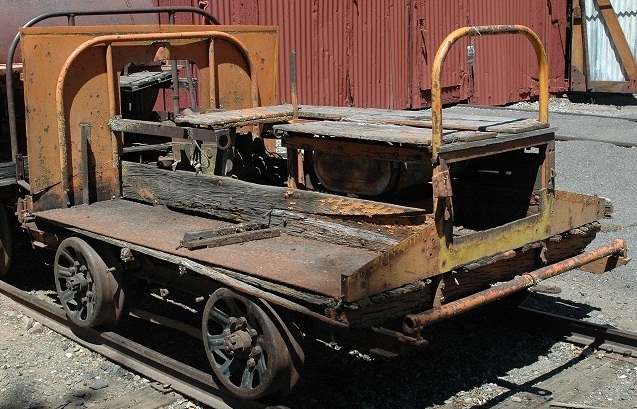 This vehicle was refurbished to its original configuration and operating condition at Railtown 1897 State Historical Park in 1998-1999. 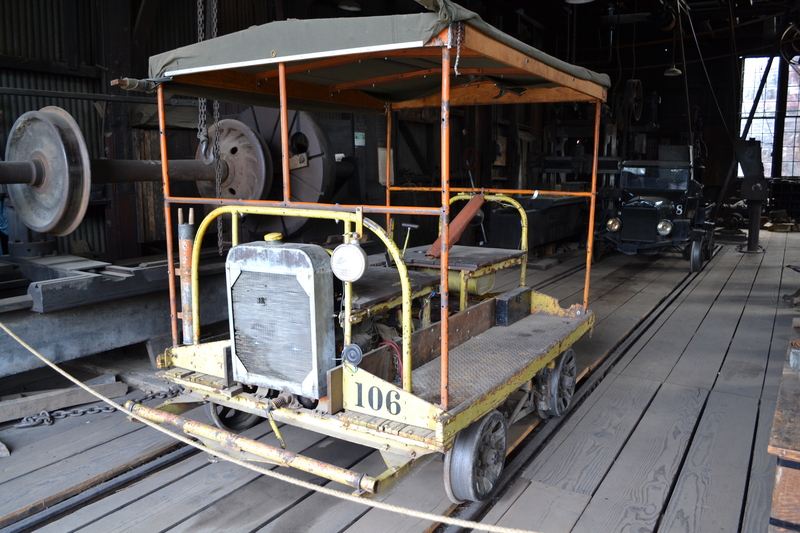 Historically, the track autos were used for track inspection, to transport VIPs to work sites, as the paymaster’s car, or as ambulances for injured workers. The Sierra Railroad rented them out for private use in the early 1900’s. Newspaper article taken from the Pott’s family scrapbook, 1907. 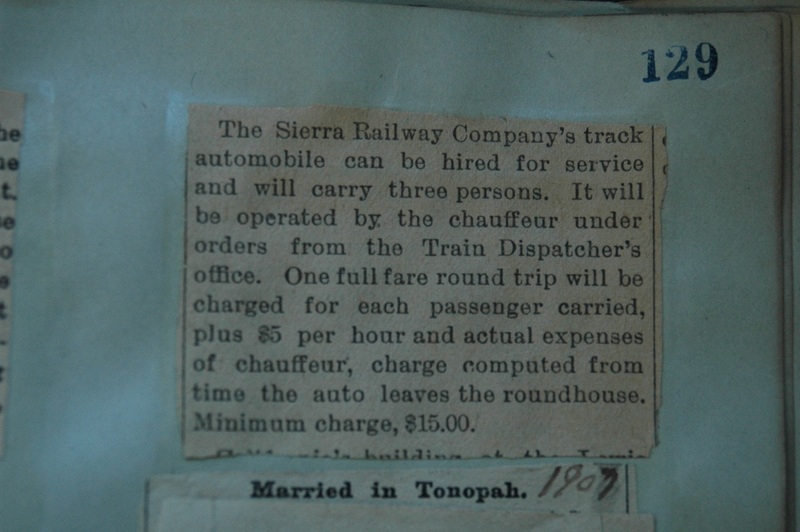 It is interesting to note how expensive it was to rent the track auto (with chauffeur) for a day, $15.00. That would be about $300.00 in today’s currency. 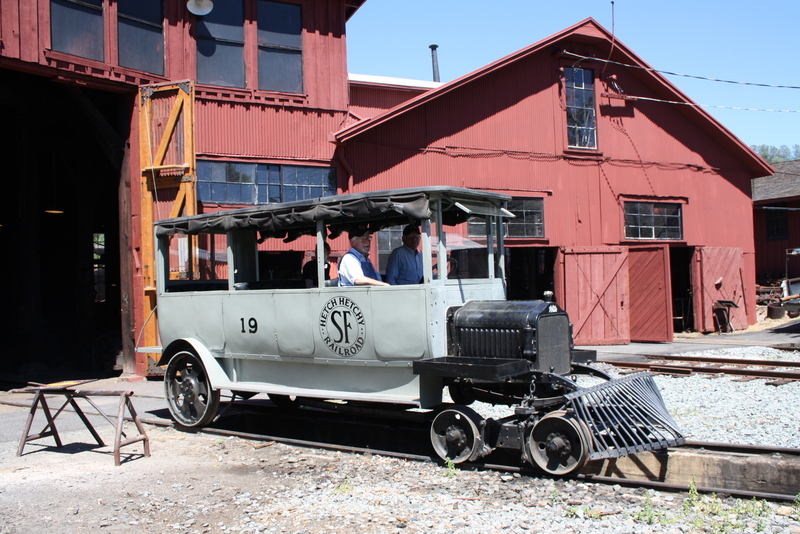 Visit Railtown 1897 State Historical Park to see the motor car collection in person. During special events you will have a rare opportunity to take a ride on the house tracks in one these unique cars that were once vital to the railroad. The No. 28 project is moving right along. 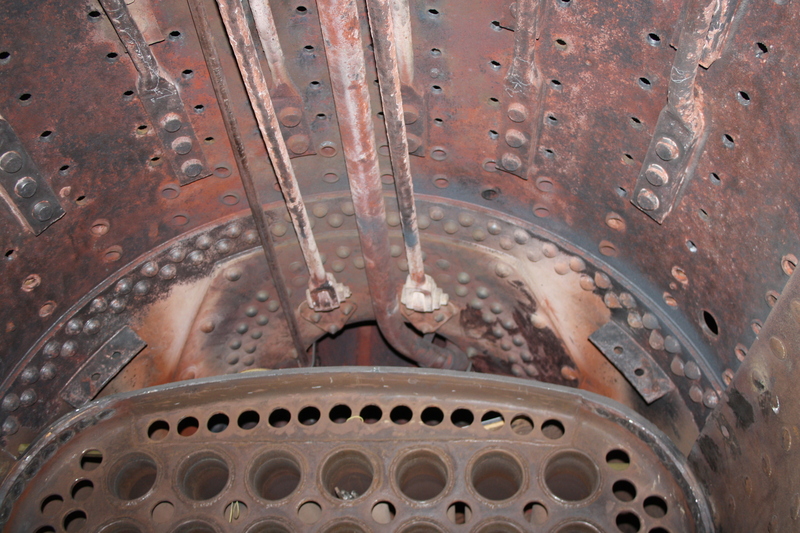 Recent focus has been on replacing thinned sections of the firebox. The firebox was assessed after a thorough descaling of water deposits. 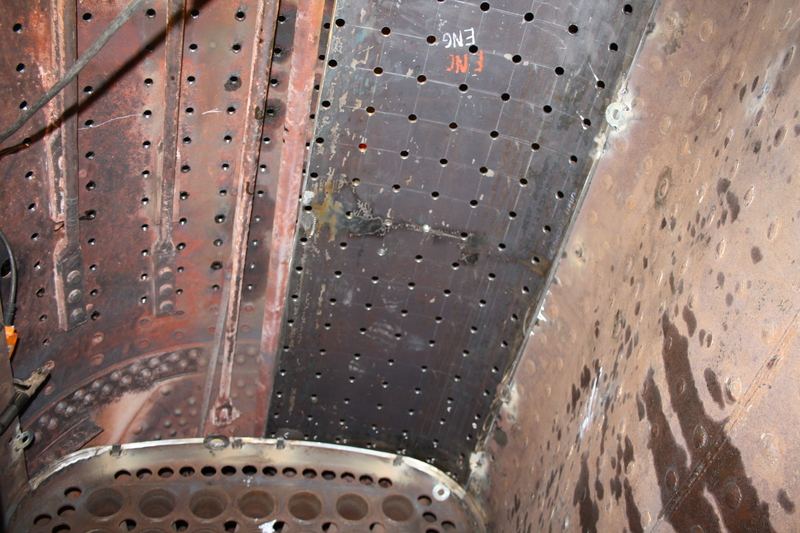 Through ultra sonic inspection the crown sheet, knuckle, and area under the firebox door all showed some signs of thinning. The original crown sheet and knuckle were removed and were sent out to have the pieces replicated. 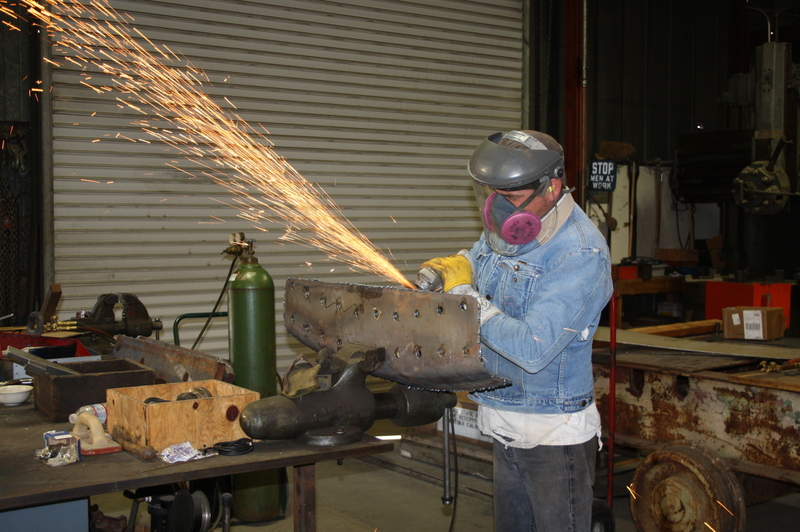 The fabricated crown sheet was formed at Benicia Fabrication & Machine, Inc. in Benecia, CA., and the knuckle was formed by Chelatchie Boiler Works, Inc. in Camas, WA.. Norm Comer cutting out original crown sheet. 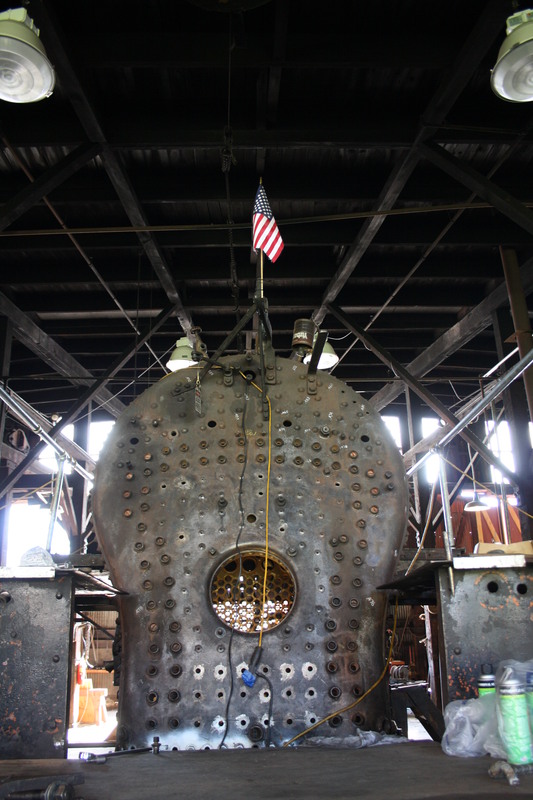 Portions of the boiler that needed to be replaced were removed in sections by a cutting torch. These pieces were lowered with a electric chain fall and sent out to be duplicated. 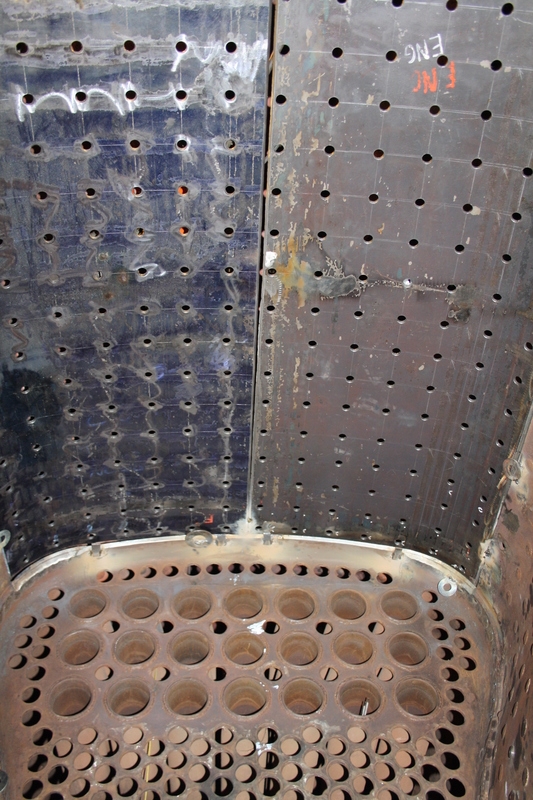 Crown sheet removed from the interior of the boiler. Once the crown sheet was removed, the exposed interior of the wrapper sheet was needle scaled to remove accumulated water deposits. After a detailed cleaning the wrapper was inspected for defects. No issues were detected. Crown sheet marked for stay bolt holes. After the crown sheet was formed and returned it was then laid out and measured. The sheet was marked in a grid format. 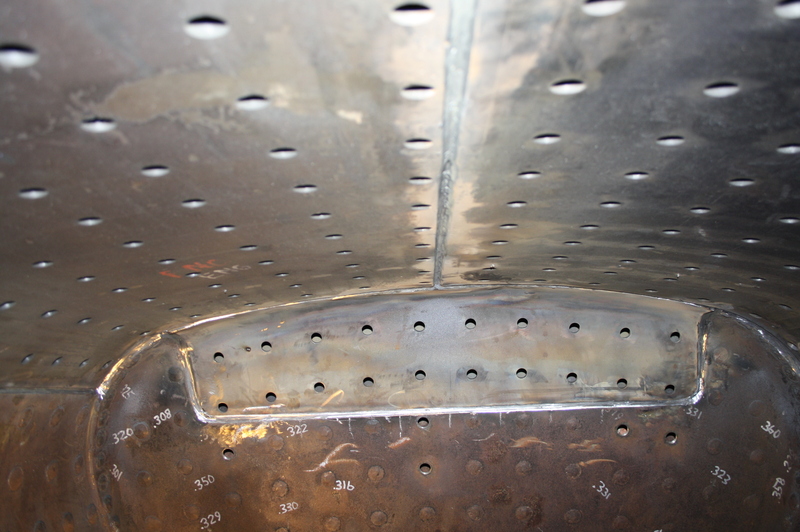 130 holes were drilled on each half of the crown sheet. 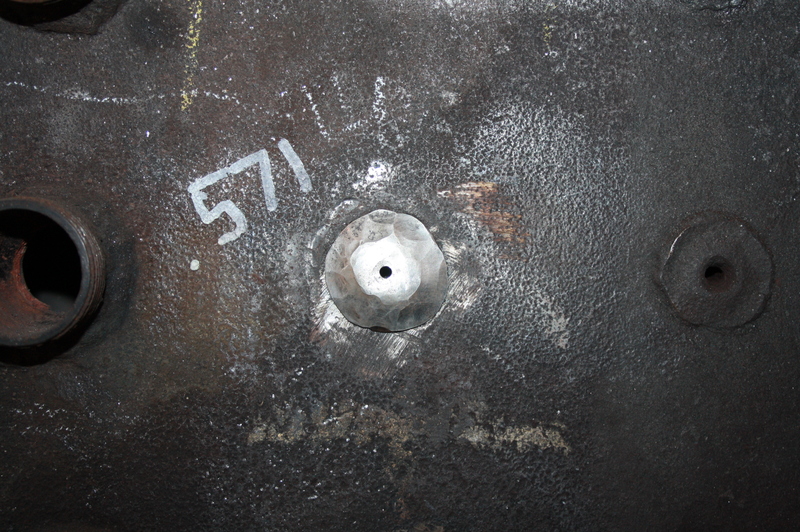 These holes will later be tapped and threaded to receive stay bolts. 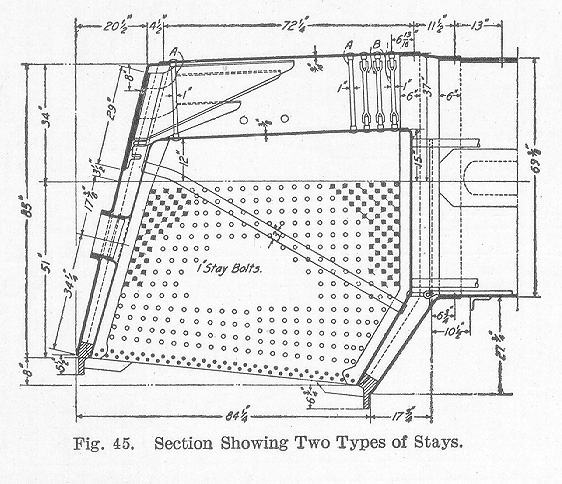 The stay bolts will connect through the wrapper to the firebox sheets. Tony Stroud and Phil Hard. Stay bolt pilot holes were drilled out at 7/8” and later will be opened up by aligned reaming to .920. 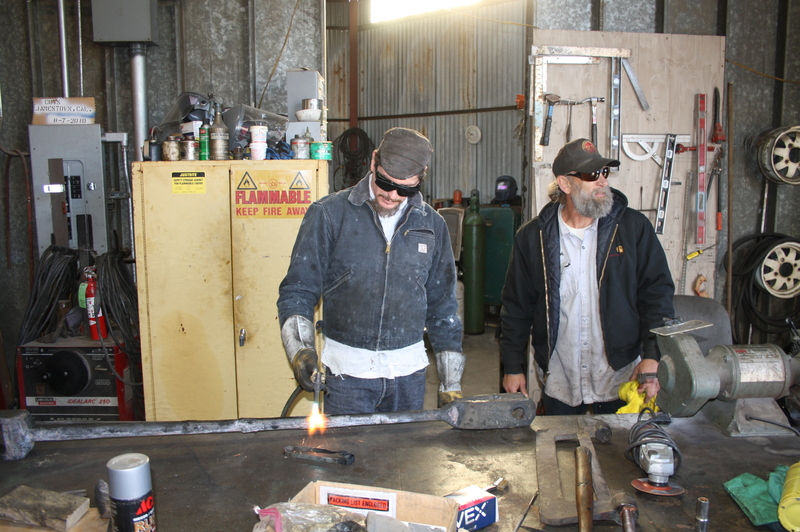 They will then be tapped with a 1 inch-12 continuous thread through the firebox and wrapper. Original and fabricated knuckle peices. 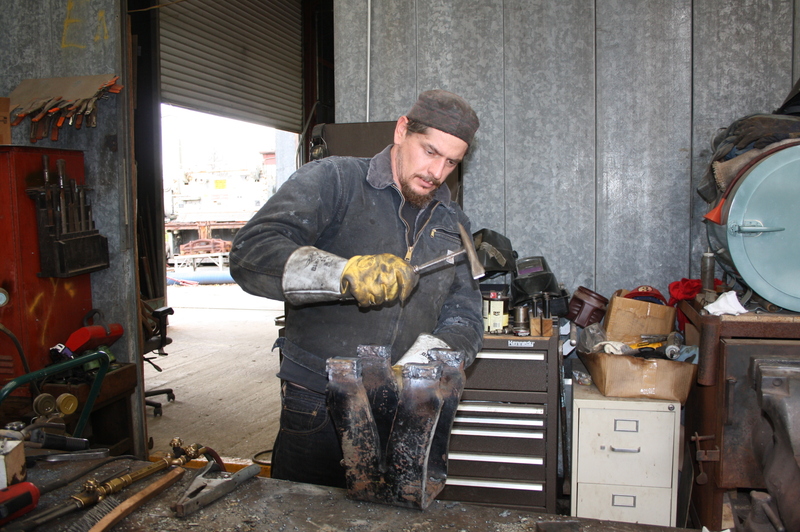 Scott Botfield beveling the knuckle prior to installation. Upon arrival, the slightly larger fabricated patches were rough cut to size by a cutting torch. The pieces were then ground down until they fit the side sheets. 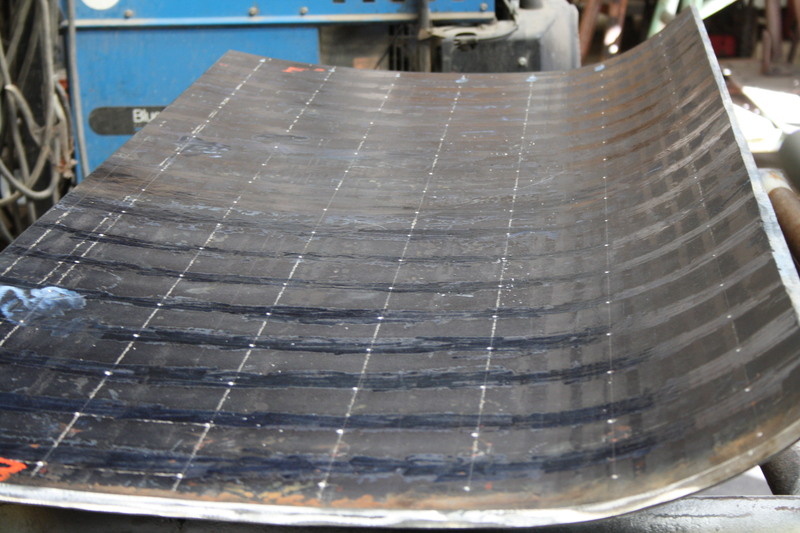 The edges were beveled down to a V which is needed for the welding procedure. Engine side of crown sheet half installed. New crown sheet halves tacked into place. 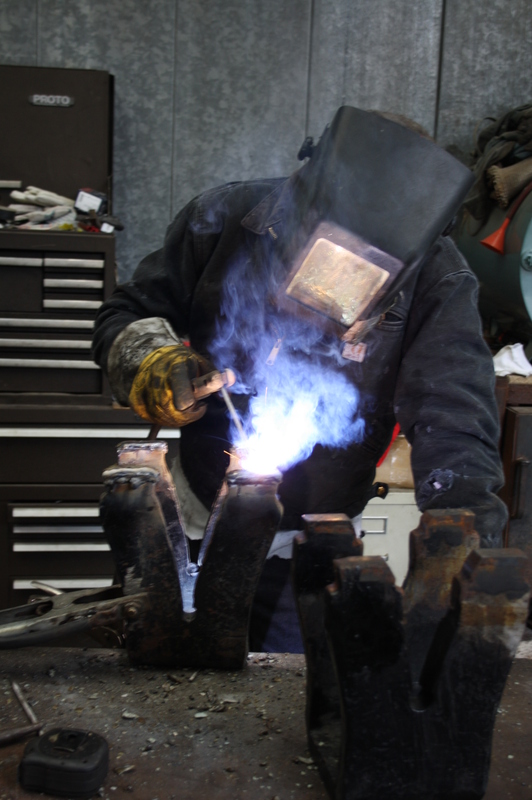 Greg Nelson welding inside the firebox. Photo by Dan Ryan. 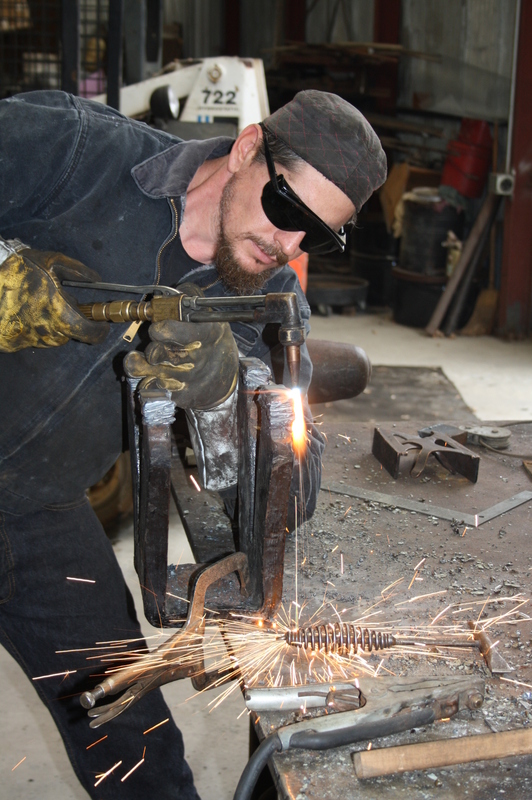 Greg Nelson welding the seam between the firebox knuckle and crown sheet. Photo by Dan Ryan. New crown sheet and knuckle welded into place. 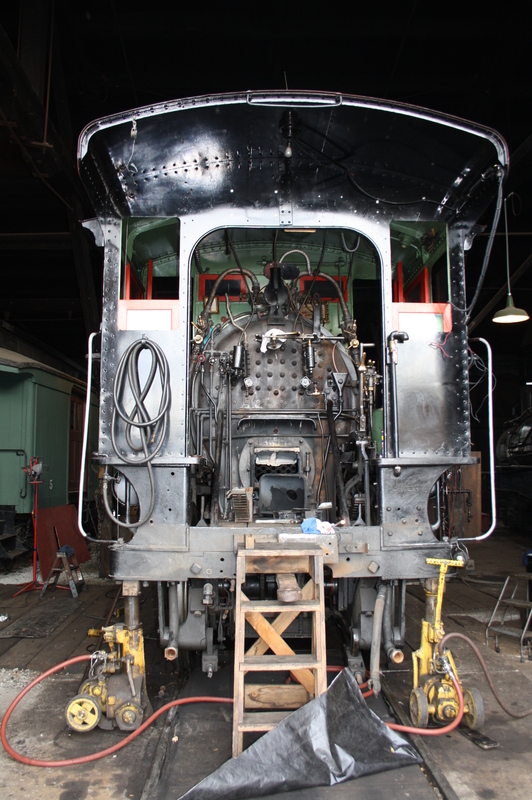 Now that the firebox is patched up a substantial amount of work is on the brink. Next step is to thread the stay bolt holes, then installing the stay bolts. Next Step: Tapping and Installing Stay Bolts.